Plan-Do-Check-Adjust - so easy to say. An inexperienced young fellow recently said to me, "PDCA is too easy. I need something more..."
At his age, I was thick too. The mist gradually cleared for me, as I'm sure it will for him. My Toyota sensei once said, "Ten years to learn Plan, ten for Do, ten for Check and ten for adjust. 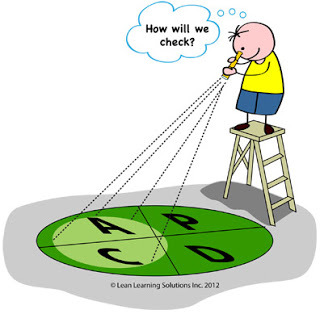 I am beginning to understand PDCA now." Forty years - for one the world's top auto executives. There isn't much that's truly new. And there are eternal verities, like PDCA. How often are we distracted, like crows, by the latest shiny object? How many people are distracted by the latest get-rich-quick scheme -- Real Estate! Gold! Emerging Markets! How many folks fall under the spell of latest & greatest motivational speaker? Some of these may have merit in the short term. But the real road to success is PDCA, the pounding heart muscle of the universe. Inhale & exhale, expand & contract, wax & wane. So with all respect to Tom Robbins and Oprah, we already know the answer. The 'silver bullet' is right in front of us. It's difficult, humbling work, but it works. As we used to say at our old Toyota factory, "If you follow the recipe, you get a Big Mac every time..."